Often referred to as Hitler’s theoretician or Hitler’s philosopher, Alfred Rosenberg codified much of the anti-Semitic, anti-Catholic, and anti-Communist rhetoric which Hitler used to legitimize his political agenda. Rosenberg’s most significant text, The Myth of the 20th Century: An Evaluation of the Spiritual-Intellectual Confrontations of our Age, was revered, at least superficially, by the Reich as second only to Mein Kampf as embodying the mythical and ideological frame for Hitler’s Germany. According to Rosenberg, for races around the world, blood was fate. Physical, intellectual, and spiritual characteristics were the products of blood. According to Rosenberg, there was no redemption for the ‘lesser’ races… their blood made them the natural enemies of the Aryan Volk… their blood had sealed their fate. One implication of this was that Jews were systematically targeted as an ethnic group, as a race… not just as a “religion.” Religious attitudes and cultural characteristics, according to Rosenberg, resulted from a people’s blood. 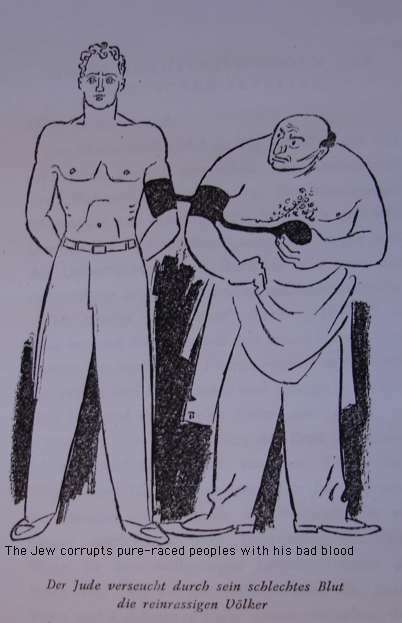 There was no concerted effort by Nazi leaders to convert Jews to Christianity, because cultural assimilation was seen as part of the problem in Germany (note the cartoon, taken from The Myth of the Twentieth Century, featured above). Many individuals were executed for political dissidence or what was perceived as physical/psychological deviance (e.g., homosexuals, mentally disabled, those identified as ‘lesser races’). The Jews, as a race, however were assigned the role of enemy number one. According to Nazi racial science, race, signified by blood, was destiny. Susannah Heschel, in her controversial text The Aryan Jesus: Christian Theologians and the Bible in Nazi Germany, notes that the Nazis obsession with ‘racial hygiene’ was predicated on their desire to “protect the body housing the Aryan spirit.” In order to prune the population and discourage miscegenation, the Nazi administration implemented forced emigration and when that failed it resorted to extermination. If the fight had been against Judaism qua religion, converted Jews would have been (presumably) safe and the main agenda of Nazi power would have been conversion. And yet Rosenberg’s fatalistic claim that one’s blood is one’s fate, ironically, is undermined by his other statements here that culture and expanding knowledge lead to the divorce of reason from nature and confuse the commands of blood. According to this estimation, blood is fate but also blood can be confused by culture. Rosenberg, along with other Nazis, seems to desire an explanation for what he perceives as the (then) ‘degenerated’ state of the German population (which thus requires the racial cleansing), but also an explanation which also exculpates those who would do the cleansing, since the victim’s fate had already been decided by their own blood. While the assessments regarding Jewish religious/racial identity might not be revelatory to readers, it was surprising to me when I first learned (as an undergraduate) that the Jews were targeted as a race and not, purely, as a religious group. My high school history courses extensively covered World War II and the Holocaust, and yet this glaring fact seemed to have been excluded. The American narrative of WWII and the Holocaust seems to have been constructed (consciously or less so) in ways that highlight religious as opposed to racial agenda of the Nazis. Perhaps America’s own violent racial history renders Americans less willing to view the Nazi genocide as racially motivated. This entry was posted in Kate Daley-Bailey, Religion and Society and tagged Alfred Rosenberg, genocide, Germany, Hitler, Judaism, Myth, Nazis, Race, Religion, WWII. Bookmark the permalink. Scientific racism in the late19th/early 20th c, has been pretty widely written about, and was a popular explanatory framework for reinscribing hierarchies formerly justified by religious/Christian ideological formations. (If I recall correctly Willard Swartley’s early text, Sabbath, Slavery, War and Women outlines the use of the bible to support both conservative and liberal positions on these subjects – the ground was fairly actively contested). When I was an undergrad, I was taught to view the Holocaust as a form of Christian failure, thereby, for many, discrediting Christianity (and for some Jews, Judaism itself, given G-d’s failure to protect the “Chosen People.”). Nobody said much (anything) about the scientific context of selective breeding, blood purity and the like, thereby questioning the veracity of science. (Note -“bad science” is what a number of folks label “science leading to conclusions we don’t currently like.” Some of the science *is* poorly done – but some is not. Check out Sir Almwroth Wright, a pioneer of vaccine immunology at St. Mary’s Hospital, Paddington, London during WW I, and author of The Unexpurgated Case Against Woman Suffrage (1913). I don’t have the text here with me at home, but would be happy to dig out and cite his position that woman suffrage, and it principle of “Egalitarian Equity” led inevitably to becoming a “negrophile” and an advocate of “natives and negroes”, then to socialism, and then to vegetarianism. He has some pretty nifty things to say about academic societies as well, and the WOGS [sic] and women who are allowed in “on suffrance only” as exceptions that prove the rule. Lots of stuff too about virile men and epicene women. The point here is that Sir Almwroth was not idiosyncratic in his views. This archival stuff is really worth looking at (check out state authorized sterilization of the “unfit” – much is made of Canada on this point, but Sweden might surprise you). Thank you for reading my post and for responding with these especially helpful comments. I think you are spot on regarding the issue of how this particular history has been ‘read’… which inevitably leads to obscuration of certain significant points. I will definitely look into these resources.